With an outstanding track record for outdoor arts, Without Walls’ work has been recognised by Arts Council England, receiving the largest new National Portfolio Organisation (NPO) funding award for 2018 – 2022. 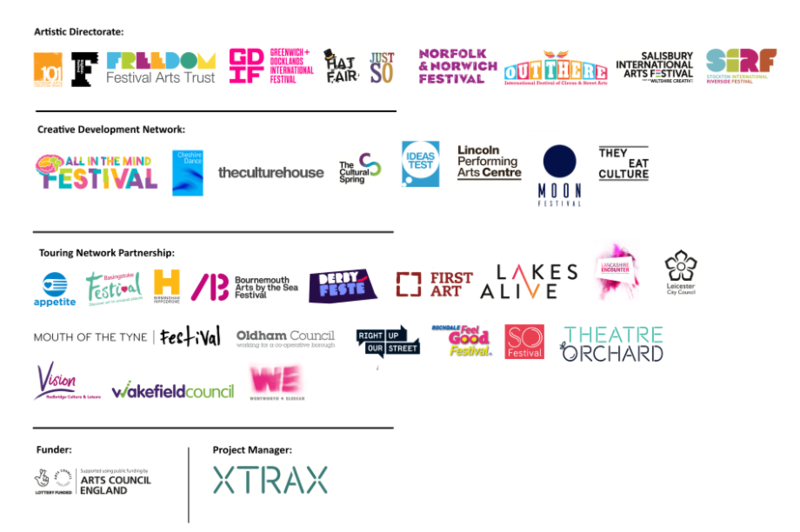 This funding allows the consortium to continue its fantastic work in outdoor arts, planning projects on a longer-term basis and enabling continued commissioning of thrilling outdoor work, reaching audiences at free festivals across the country. This enhanced commissioning investment is supporting the creation of 13 new outdoor performances, which in 2018, will tour to eight leading outdoor arts festivals across the UK and reach tens of thousands of audiences. As part of an expanded portfolio of work made possible through the NPO funding, Without Walls announces the new ‘Blueprint’ Research and Development (R&D) Investment Fund with 21 awards to artists to explore early ideas for bold, innovative and ambitious new outdoor works, with the aim that they will be completed in 2019 or 2020. ‘Blueprint’ signals the start of a four-year rolling programme to support innovative artistic development across the outdoor arts sector, fuelling artistic and strategic development, as well as reaching vast audiences through wide touring. Without Walls’ Blueprint projects span multiple art forms including circus, contemporary dance, digital art, sound installations, music, puppetry, sculpture, and theatre. The 21 artists and companies come from across the country and were selected from 120 applications; they include; experimental acrobatic circus ensemble Barely Methodical Troupe; Manchester-based Melanie Wilson, an award-winning multi-disciplinary artist with work underpinned by strong political interest; Oxford-based Radio 3 presenter and founding member of Oily Cart Max Reinhardt with a collective of artists; and a collective of electronic sound artists including Scanner (Robin Rimbaud), Kathy Hinde and Mike Blow.